30A power cord for powering our 30A control panels. It plugs into a standard 4-slot North American dryer wall receptacle (240V/30A NEMA 14-30R with ground). A locking female connector is used on the control panel side for added safety. US only sales for this product (more information). The power cords are 10 feet in length. Custom lengths are available. Email us for details. The 30A control panel power cord plugs into a standard North American dryer receptacle (4-prong 30A/240V). Ask your electrician to install a NEMA 14-30R receptacle. In the electrical breaker panel, the circuit breaker must be a 30A / 240V 2-pole breaker. We recommend that the breaker include GFI protection. Is a ground fault interrupter (GFI) included? No. A GFI must be used and may be installed in one of two places: Either in the circuit breaker in your home's electrical panel, or in-line with the control panel power cord. We recommend that you check that whatever GFI you intend on using adheres to your local electrical code in terms of trip settings and speed of operation. 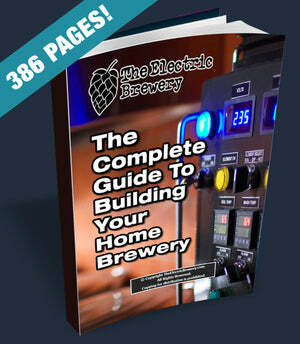 A GFI is an absolute requirement for safe brewing. Do not confuse a GFI with a circuit breaker: A circuit breaker saves equipment, a GFI saves lives. For more information see our section on control panel supply power. Visit our official Control Panel Power Cord product thread in our forum.